Waiouru: First Short Cruise… and in reverse! Well there were all sorts of noises from the roof of Waiouru as we were bashed around by the wind and rain yesterday evening. I became quite concerned and dressed in warm weatherproof clothing to go out and check everything was alright! It was… all I did was open the rear cockpit doors which currently don’t have catches and as a consequence were rattling and banging in the wind. This morning Waiouru rocked and then the engine of Windrush; which is breasted up to us; burst into life and moved off. 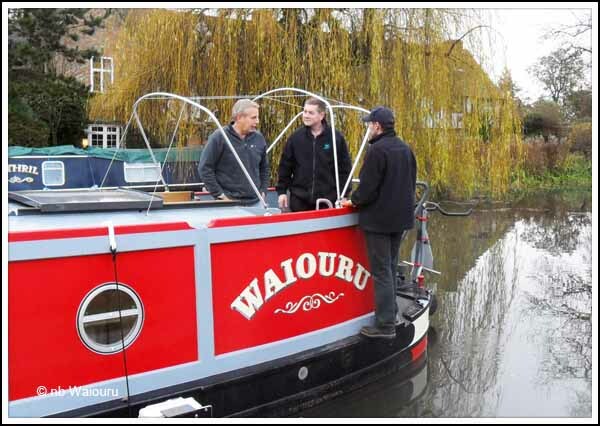 Nick and Darren then started untying Waiouru’s mooring ropes so I asked what was happening and where were we going? They had decided to turn Waiouru around in order to reach the starboard side. A flurry of activity from Jan and I saw Jan on the towpath with our new BW key whilst I stayed on Waiouru with Nick and Darren. I then remembered the camera and passed it to Jan calling our “Take plenty of photos”. I asked Nick where we were going. In the downstream direction there is a lock and winding hole whilst upstream is a lift bridge across a busy Class A Road and another winding hole. We were going through the lift bridge which is why Jan needed the BW key. The plan was to reverse up stream under the lift bridge; wind Waiouru (turn her). 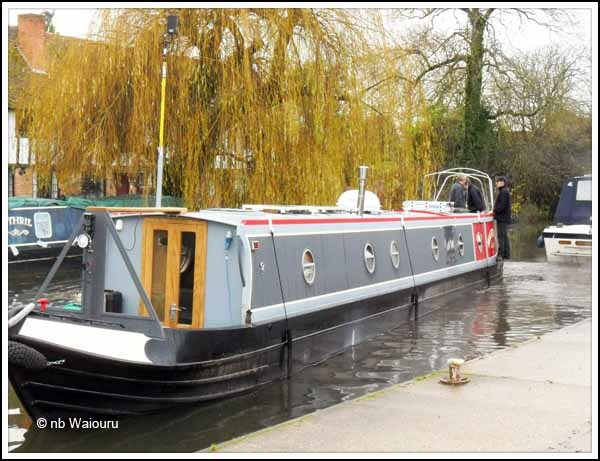 Then reverse back under the lift bridge and back onto our original mooring. Nick asked if I’d like to steer but I declined using the excuse we haven’t yet taken delivery. Actually I didn’t want my first opportunity to steer Waiouru to be in reverse under a major road lift bridge <chicken>. Nick has the tiller and throttle whilst Darren managed the bow thruster controls. Who’s have thought her first voyage would be in reverse! Jan got so involved in controlling the lift bridge and separating Bo <the dog> from Ollie <the swan> that she never took any photos of Waiouru reversing under the bridge or winding. 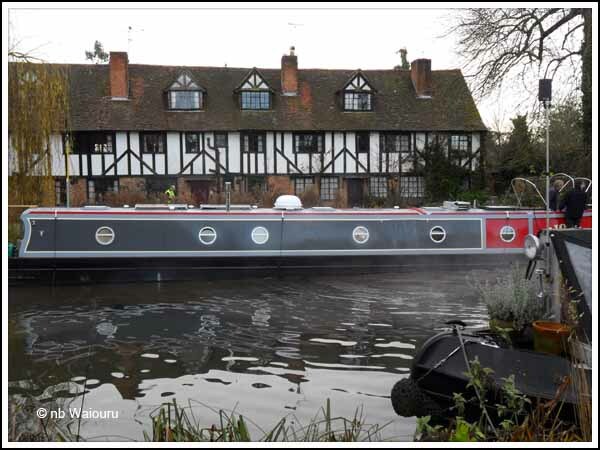 And before you knew it we were back at the mooring. 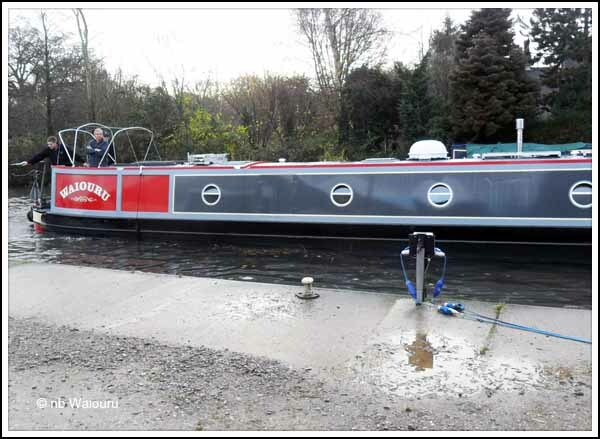 I think Nick and Darren had a “little play” when mooring as they brought her in sideways using the prop and bow thruster. Darren had finished painting the front bow thruster locker panel so I carefully refitted it using stainless steel machine screws dipped in silicone grease. Nick spent much of the morning finishing the engine compartment. The domestic batteries have now been tied down along with the hospital exhaust. He also fitted a valve into the outdoor shower head on the stern. It means we should be able to isolate the shower head in very cold weather hopefully preventing any damage caused by freezing temperatures. Although the day has been dry, and at times sunny, by mid afternoon the mercury had started to drop, so tonight’s walk will have to involve jacket, scarf, gloves and woolly hat. When you come to step off the boat tomorrow morning, don't forget that the land is now on the other side!